Square stitch aligns beads in neat rows and columns that looks like loom beadweaving. But square stitch is the perfect option for smaller items that don't make sense to spend time warping a loom, like these square initial letter pendants. 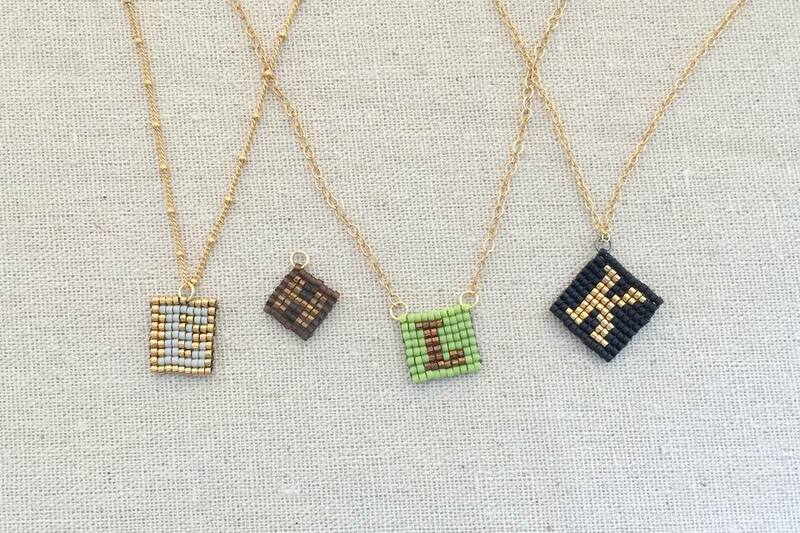 Beaded initial letter pendants are a great way to add a personalized touch to jewelry. These pendants can be made using leftover beads from other projects and stitch together pretty quickly since they are not very large. If you are not familiar with how to make or how to read a loom beadwork pattern, this is also a great project to learn the basics of both. If you are not familiar with square stitch, learn the basics with this square stitch beading diagram or square stitch tutorial. Square stitch and beading loom patterns are easy to make using graph paper. Each square on the graph paper corresponds to one bead in the pattern. Standard graph paper squares may be too large for large and detailed patterns, but you can download special graph papers for designing beadwork from a variety of sites. This square or loom stitch graph paper from Fire Mountain Gems can be opened in your browser and printed. Once you have the right graph paper, use a pencil to start drawing your letter design. You will want to shade lightly at first, so you can make changes as needed. 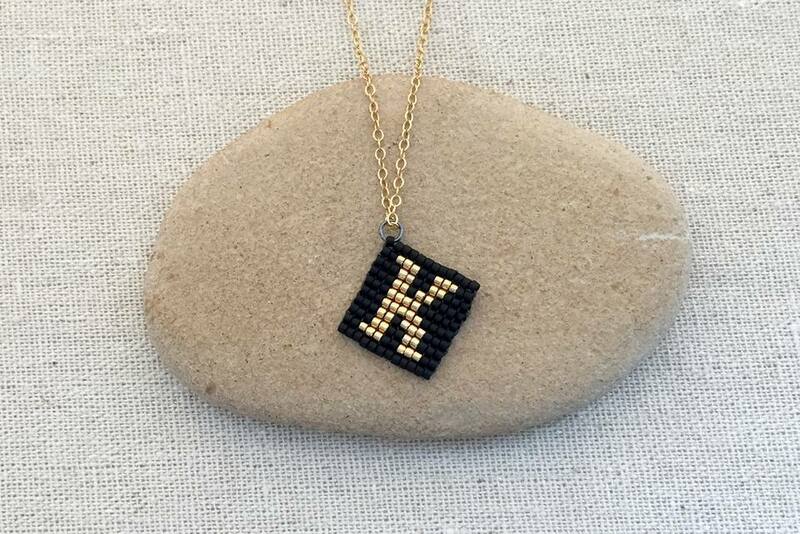 The letter K design used in this project is 10 beads square. Once the design pattern is made, you can chart out the order to string the beads by writing how many of each bead and what order they are placed in. Label the rows to show which direction you will be stitching. In this sample, the odd rows are going to the right and the even rows are stitched going back to the left. It is stitched from bottom to top. On the right of the pattern, you see the number of each bead needed based on assigning the light bead color A and the darker bead color B. There are several different types of beading software that can be used to make a beading pattern with your computer. The one pictured here is made with BeadTool 4. You can use it for free, but in order to use more advanced features such as save and print your patterns, you will need to purchase a license for the software. The advantage of software like BeadTool 4 is that they typically have the bead sizes, shapes and color palettes from manufacturer's like Miyuki, Toho and Preciosa already loaded into the tool. This allows you to play with designing the pattern as well as selecting colors. One other feature that is very useful is being able to change the colors on your pattern quickly and easily. In Beadtool, you just need to find the new color and drag it to the area that you would like to replace. This opens up a whole new world of design possibilities. Another example of several different colorways made using the Bead Tool software can be seen in this group of free charted peyote stitch patterns. This tutorial will use the letter K pattern as an example. The basic instructions will remain the same regardless of what letter you are stitching. What may change is the number of beads on each row and the order that you pick up the beads. Prepare a length of beading thread. This project uses 6lb FireLine beading thread in Smoke color and a size 11 Tulip beading needle. The beads are size 11 Toho Japanese cylinder beads. Pick up beads for the first row plus one additional bead. The extra bead will be used when you make the turn for the first bead of the second row. To start the square stitch, stitch back through the second to last bead. Pull your thread taut and align the beads so the last bead you picked up is sitting on top of the bead in the base row. Insert your needle through the last bead to be in a position to pick up another bead and stitch the rest of the second row. Continue square stitch to the end of the row. To make each stitch, pick up the next color bead following the pattern. Stitch back through the bead directly below it on the prior row. Then put your needle through the bead you just picked up a second time. Pull the thread and align the bead so it sits on top of the bead on the row beneath it. Continue in this manner until you reach the end of the row. This step is optional, but it really helps the beads to sit straight and align correctly. After every two rows, stitch back through the entire previous row and then through the row you just created. This will pull the beads a little closer to each other and help them into a straight row. Continue square stitch following the pattern that you created. Each bead is added individually, so it takes a little bit of extra time, but since the pendant is small it will still go quickly. It is definitely much quicker than if you tried to create this with a loom! When you have reached the top, stitch back to the bottom of the pendant by going back through the rows in a zig-zag fashion, the same way you reinforced after every other row. This will tighten the shape into a square and also put your working thread in position to be tied into a knot with the tail thread. Remove the stop bead and tie a square knot with the working thread and tail thread. Pull the knot tight. With the needle on the working thread, stitch back through the bottom row with your needle coming up somewhere in the middle of the row. Pull sharply until the knot you just tied pops inside the first bead on the row. This will protect and hide the knot. Trim the working thread close to the bead it is exiting using sharp embroidery scissors or a thread burner. Add a needle to the tail thread. Stitch through the first several beads on the second row coming out between two beads in the middle of the row. Don't pull on this thread too hard or you will pull the knot out of the first bead. Just make sure the thread is pulled taut. Trim the thread the same way you did in the last step. Open a jump ring and thread it through a bead on the corner of your initial pendant. Close the jump ring and add a dab of glue to keep it closed. You can choose to hang your pendant by the top corner, add another jump ring to the other side to have it hang straight on a chain or by adding a jump ring through a bead in the center of the pendant. Thread a chain through the jump ring to complete your necklace. This pendant looks great as the focal of a necklace, as an assemblage of charms or on a bracelet. Experiment with designing a pattern using capital or small letters and different fonts.